When you work in aviation, you know getting a flight from its point of origin to a destination isn’t always easy, and obstacles are the norm, not a rarity. What matters most is how well prepared you are to respond to those obstacles. Maybe that’s why Satya Sunkavalli is such a great fit for the industry. Her journey toward a degree hasn’t always been easy, but now she’s ready to take flight. visa in late 2010 with the intent to earn a pilot certification. She enrolled in a flight program at another institution in Indiana, but personal obstacles prevented her from completing her studies. She transferred to a comparable flight program in Florida with the hope of finishing, but despite a solid performance on the verbal portion of her test, she did not pass the flight portion. With that renewed spirit, she placed her pilot-training goal on hold and enrolled at Ivy Tech Community College to study aviation from a mechanical perspective. Aviation Maintenance Technology instructor Brad Stark has taught Sunkavalli in four of his classes, with course content ranging from aircraft fuel systems to sheet metal fabrication. “Satya strives to do her best at everything she does, and she tries to help the other students,” Stark says. 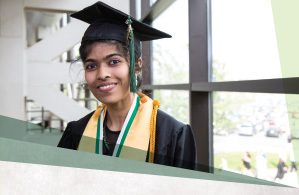 Sunkavalli’s achievements go beyond the classroom. She’s an advisor for the Aviation Explorer Post 2035 and the Experimental Aircraft Association’s Young Eagles Youth Program, both based at Smith Field in Fort Wayne. Sunkavalli also takes pride in her association with the local chapter of The Ninety-Nines, an international organization of women pilots founded by 99 licensed women pilots in 1929. Aviation icon Amelia Earhart served as the group’s first president. And most recently she was named a 2015 Newman Civic Fellow, an honor given to inspiring college student leaders who demonstrate an investment in finding solutions for challenges in their community. Sunkavalli says she wants to become a certified pilot and also be among the first to apply for work at GE Aviation’s new $100 million, nextgeneration jet engine assembly facility being built in Lafayette, Ind. Now that she has her degree, she’s cleared for takeoff. “Working at a global company like GE would be a great networking opportunity and help me stay on course with aviation and everything I’m looking for in my career,” Sunkavalli says.